Your stomach’s rumbling, your workload is pressing, and your temper is flaring—you’re hangry! Pity the fool who comes between you and the lunch buffet. Here’s how to avoid overreacting when you’re craving sustenance. Got that irritable feeling where you're hungry and angry at the same time? You're hangry, but there are ways to address it—and ways to prevent it. Two days before I was assigned this story, my husband demanded that I eat breakfast. He’s not usually one to tell me to do something (he learned 22 years ago that ordering me around doesn’t end well). In this case, however, he knew it was in our family’s best interest to feed me. I’d cut carbs from my diet two weeks prior to his royal proclamation, and my mood (and family) were paying the price. I’d become hangry—irritable, impulsive, and overall cranky to anyone who crossed my path. I needed carbs, and I needed them soon. Luckily for my marriage (and the mental health of our two children), I ate a big, healthy breakfast and soon felt my “hanger” dissipate. My family breathed a collective sigh of relief over their pancakes. Normally, I consider myself to be a rational person. It takes a lot to irk me, so I was surprised by how quickly I flew off the handle while I was in a food-deprived state. That got me wondering: What does it mean to be hangry? What causes this condition, and is there a way to prevent hunger from ruling our emotions? Here’s what I learned. Officially added to the Oxford English Dictionary this February (and also counted as a real word at Merriam-Webster), the hangry definition is as you’d expect: “Bad-tempered or irritable as a result of hunger.” Sound familiar? It’s safe to say the majority of us know the feeling. “Usually we get ‘hangry’ because there is blood sugar instability or a severe drop in blood glucose levels, which some health practitioners refer to as ‘reactive hypoglycemia,’” says Rochelle Sirota, a New-York based Certified Dietitian-Nutritionist. Research has proven that having low blood sugar can lead to aggression. But what about other emotions—such as frustration, irritability, or anxiety? According to Jennifer MacCormack, M.A., a lead researcher of several studies about the science of being hangry, biological changes caused by hunger (e.g., increased levels of cortisol and adrenaline, which can cause rapid heart rate and increased blood pressure) play a key role in triggering emotions. “Hunger is literally generating a very basic emotional feeling of being negative or unpleasant and tense,” she explains. In general, MacCormack says, hunger by itself doesn’t make a person emotional. If someone who’s hungry is exposed to a negative or unpleasant situation while feeling negative, he is more likely to become “hangry” and blame his anger on outside sources or factors. On the other hand, someone who is hungry, happy, and exposed to a positive or neutral situation is more likely to recognize hunger as the culprit of any feelings of unease. Thus, she’ll more likely reach for a snack—and then deal with a situation calmly. In MacCormack’s most recent study, published in the journal Emotion, she found those who take the time to think about their emotions don’t get as hangry when their stomachs are rumbling. Her other finding: Those who don’t think about their emotions are more likely to blame their hunger-induced feelings on external sources. “This temporary lack of awareness leads us to misattribute or blame our feelings on something in the environment, rather than on the fact that we are just hungry,” she explains. The take-home: Being emotionally aware can prevent you from becoming hangry and lashing out at those around you. Quick Fix for Weight Loss, But Does It Work Long-Term? What Are the Effects of Being Hangry? In addition to the obvious—becoming irritable, cranky, and tearing into any passerby—being hangry can cause other, more serious conditions. The result: We could hurt and damage our relationships with friends, family members or colleagues. Can Being Hangry Affect Us Negatively in the Long-Term? Is There a Cure for Being Hangry? Feed yourself! “The treatment for preventing hangriness involves consuming balanced meals (and perhaps snacks, too) well spaced throughout the day,” suggests Sirota. And don’t reach for junk foods—they can raise your blood sugar rapidly, causing it to crash shortly after and make you crave even more high-calorie, high-sugar treats, Hartung says. Can I Prevent That Hangry Feeling? Another tip: Become emotionally aware. “If you can catch yourself becoming hangry—your awareness may be enough to put you back in the driver seat and help you avoid acting on that hunger,” says MacCormack. Meditate, get a good night’s sleep, try a few stress-relief strategies, and exercise regularly to promote relaxation. 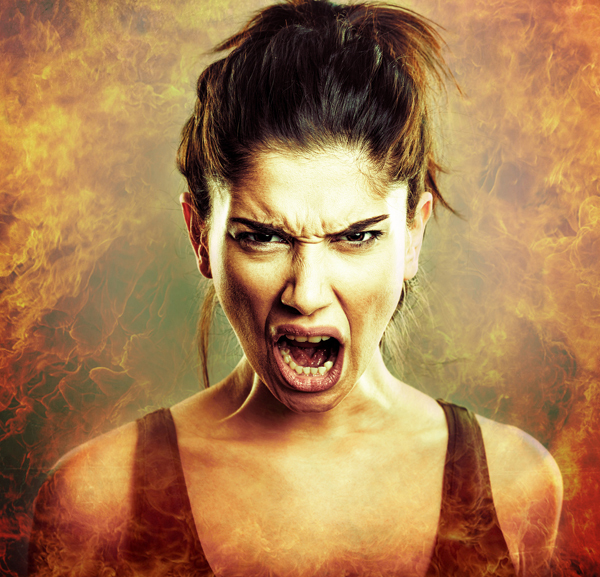 If anger is an issue, read our post Anger Management: 15 Ways to Tame Your Temper. Still struggling emotionally? Seek help from a professional. So, if we’re feeling hungry and hot, sticky, and uncomfortable during the summer, we may be more prone to becoming hangry—especially if we aren’t paying attention to our feelings. Another reason for the change in hangriness levels: our diet. In the summer, MacCormack says, people tend to eat more fresh, healthy foods, while in the winter months we’re more prone to carb- and sugar-loading. The result: a quicker blood sugar crash in the winter, which destabilizes our blood sugar and can lead us to feel more hangry. Eating a healthier diet with more protein and veggies throughout the year may go a long way to help prevent us from becoming hangry. adrenaline, always hungry, anxiety, blood glucose levels, blood pressure, blood sugar, blood sugar levels, breakfast, children, cortisol, depressed, diet, energy diet, exercise, food, glucose, glucose levels, headaches, health, healthy breakfast, high energy diet, Lose Weight, low blood sugar, mental health, military diet, mood, protein, reactive hypoglycemia, sleep, stress, stress relief, sugar, sugar levels, why am i always hungry, why am i always hungry even after i eat.